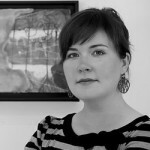 Kindra Crick is an artist who gives visual expression to the wonder and process of scientific inquiry and discovery. In her installations and layered mixed-media work, she incorporates drawings, diagrams, maps and imagery from under the microscope. Drawing on memory and addiction research on the perineuronal nets surrounding neurons by neuroscientist Dr. John Harkness from Dr. Sorg’s lab at WSU, her installation ‘Your Joys, Sorrow, Memory and Ambition’ consists of over 1000ft of hand woven magnet wire with netting-wrapped tendrils of lit cables – imagining the microscopic elements that might preserve or disrupt the very core of our memories and essential sense of self. What are your earliest memories? Are they clear to you, are they singular, or are they hazy, more of a feeling than a vivid image? Are some of your memories based on photographs from an event you knew you attended, like snapshots of your fourth birthday party? How much can you separate the photograph and the memory? After all these years, how are the details –the flavor of the cake, a cherished gift, the people crowded around in celebration– bound together? Have those details in fact changed with the passage of time, altering upon each recollection? How much is malleable and how do some persistent memories seem to have an organic stamp in time? With books, photographs and artwork, we create touchstones in our lives by committing a thought to paper or etching an image in time, creating a physical substrate that will lock in connections, fleeting thoughts or a visual representation of a person, place or encounter. But how does our brain maintain the web of the interconnected details of our life decades after those connections were made, bound together, and consolidated by the hippocampus? What molecular machine locks in our long-term memories, these neural echoes of our experience? How flexible are they and how might they change? 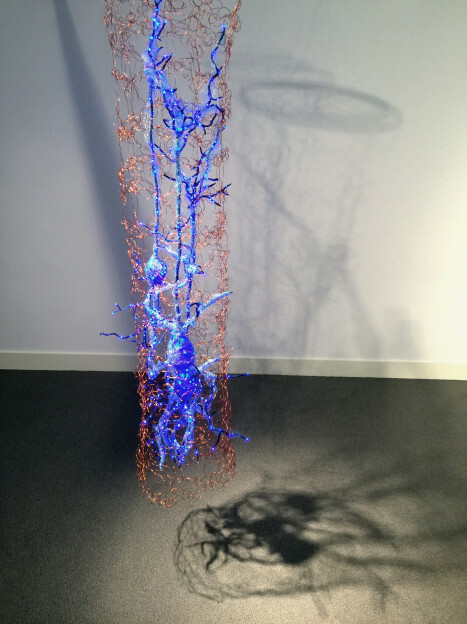 My work explores the intersection between the ‘two cultures’ of science and art which share a common wonder at the creative possibilities of the material and natural worlds. I am fascinated by the human brain–our complex machine–which can fathom the beginning of time and the nature of its own thought. However, even after centuries of study, scientists are only now starting to chart the mysterious biological map of our cognition. During the fall of 2015, I was paired with Dr. John Harkness as part of a collaboration through the Portland-based non-profit NW Noggin due to our shared interest in the molecular mechanism of memory. NW Noggin is a neuroscience outreach group that seeks to spark a lifelong interest in science and art. 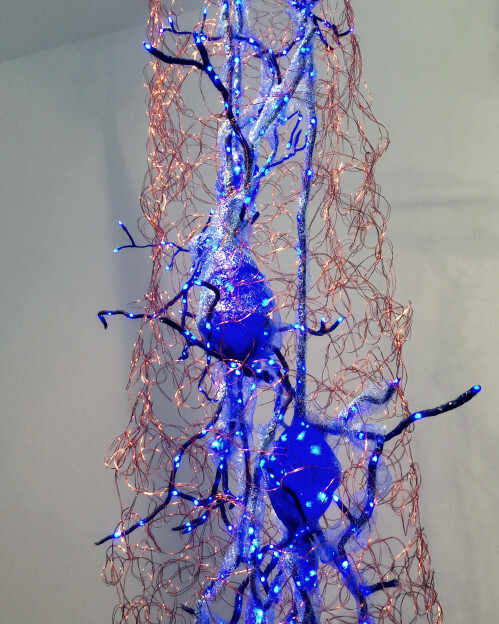 Founded by neuroscience educator Dr. Bill Griesar and Portland-based artist Jeff Leake, NW Noggin regularly brings together students, scientists, educators, and artists to enthuse and inform the public about neuroscience and art. At the time, Dr. Harkness had just begun a postdoc fellowship in Dr. Barbara Sorg’s lab at Washington State University, investigating the role of perineuronal nets in cocaine-relapse behavior and memory. 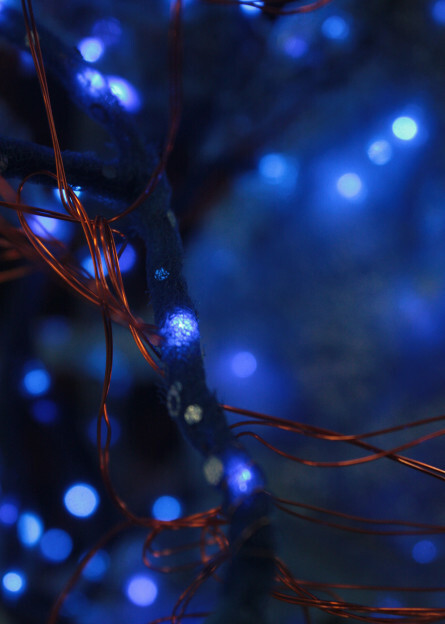 For our NW Noggin collaboration, I created an installation piece, using over 1000 feet of hand-woven copper wiring and netted fabric to illuminate these net-like structures that cradle the neurons in our brain. 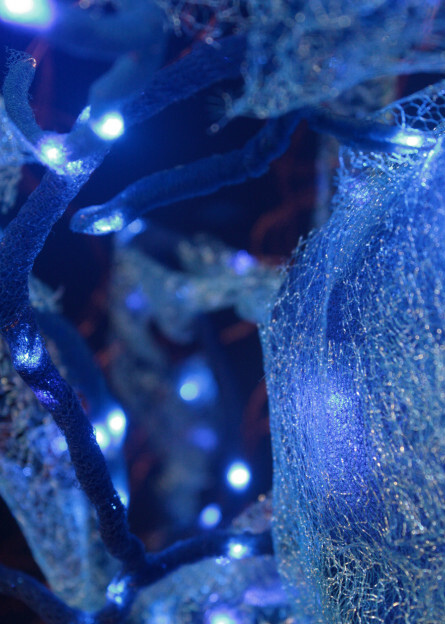 Over eight feet high, Your Joys, Sorrow, Memory and Ambition, is lit by a glow of blue LEDs illuminating a trio of neurons suspended from the ceiling. 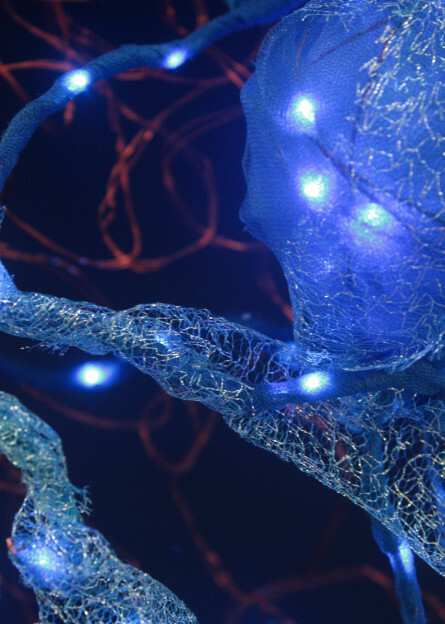 To echo Golgi, each neuron is corseted in netted fabric that shimmers in its delicate embrace of scraps of memory held within each synaptic connection. 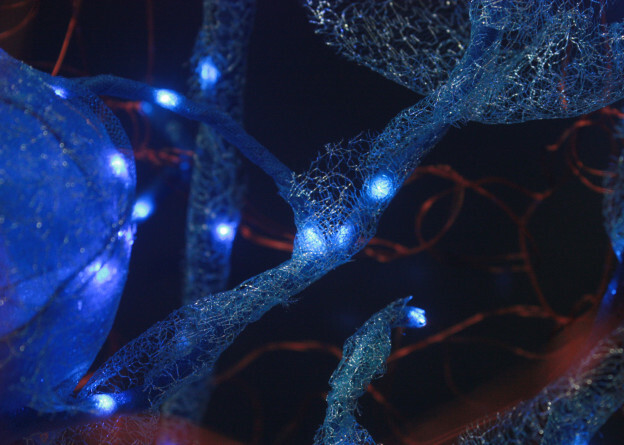 Dendritic arms made of fabric-wrapped wire reach out and create an amplified experience of neuroplasticity and illuminate the extra-neuronal machinery of these perineuronal nets. In magnifying and reimagining the hidden molecular structures of the mind through art, I want to evoke the wonder of discovery and offer an imagined vision of the spectacular biological machinery which comprises the very core of our memories and our essential sense of self.